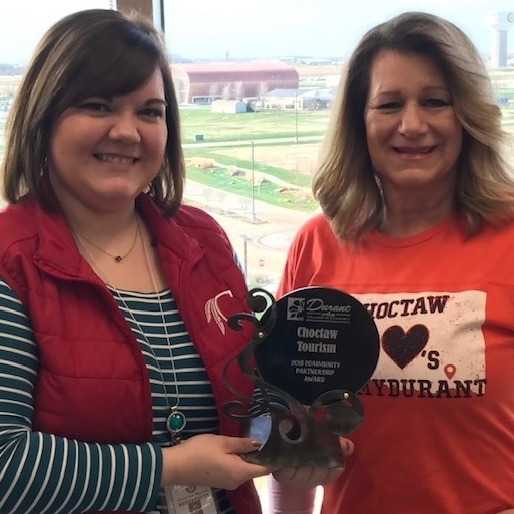 Erin McDaniel (left), and Jo McDaniel of the Choctaw Nation Tourism Department display the Community Partnership Award received at the Durant Area Chamber of Commerce annual banquet. Choctaw Tourism honored by Durant Chamber of Commerce. Choctaw Tourism received the Community Partnership Award at the Durant chamber’s annual banquet held Jan. 19. Many presentations were made at the sold-out event.